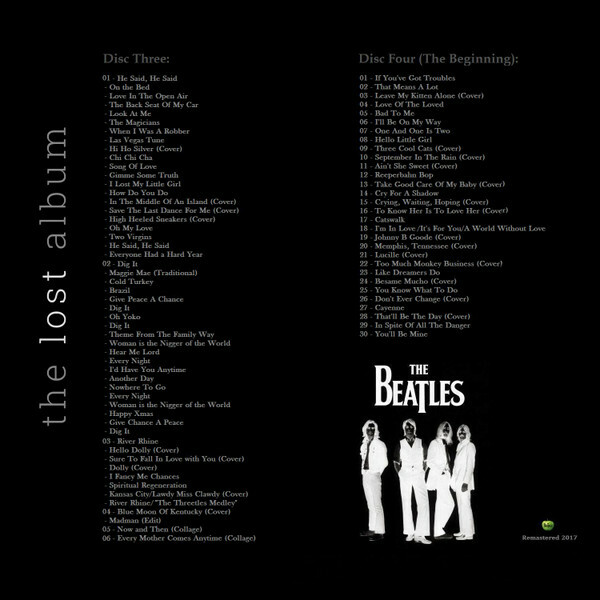 "The Beatles - The Lost Album - 2017 - 320 kbps - Bootleg - Extended Edition (6 CDS) NOT FOR SALE! Amazing rare and ultra rare unreleased Beatles songs. This is the best Beatles Bootleg so far, on best quality. The album had a great production and sounds like a George Martin/Jeff Lynne's production (as in the sensitivity to choose tracklist order, fix tracks, clean up, tracks transitions, cover art, etc.). The collection is incredibly complete of unreleased Beatles tracks (only few songs were left out: some covers/blues/jam with low quality-performance production). In short: unlike most bootlegs that are just a put together rarities, this album is very well-architected in its concept and you feel the pleasure of listening to a "lost classic Beatles album". (because it is a bootleg (not for sale) I believe that there is no problem posting the download link here (if it is not allowed, I apologize to the administrators, just delete the link, but keep the topic, because what matters is the general knowledge of the album). - Can You Take Me Back? 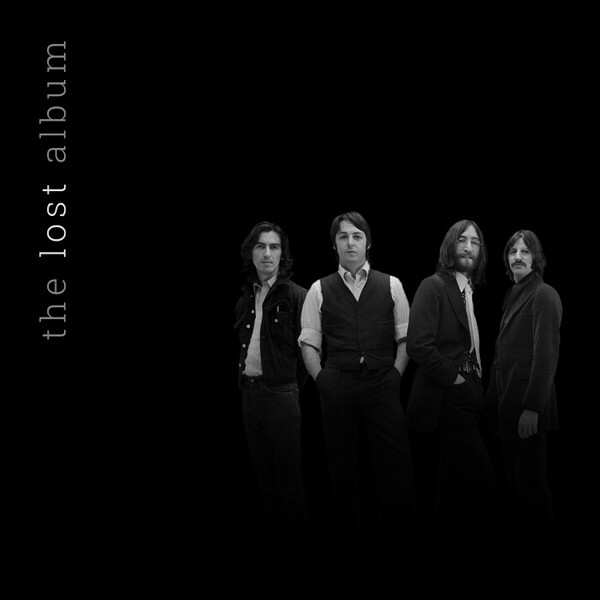 'The Lost Album' was born from the idea of gathering for the first time all the Beatles unreleased compositions, performed by themselves, as well as cover versions that were not included in any official album. Many of these tracks come from demos, home recordings, rehearsals, etc, so the original quality is low. In this album we try to improve the audio quality as much as possible, recovering audio drops, fixing technical problems, recording failures and so on. Software tools have been used to clean, remaster and enhance the tracks, without ever losing the fidelity of their originals. Short and unfinished songs were sewn into each other, with soft transitions, resulting in a more consistent track. 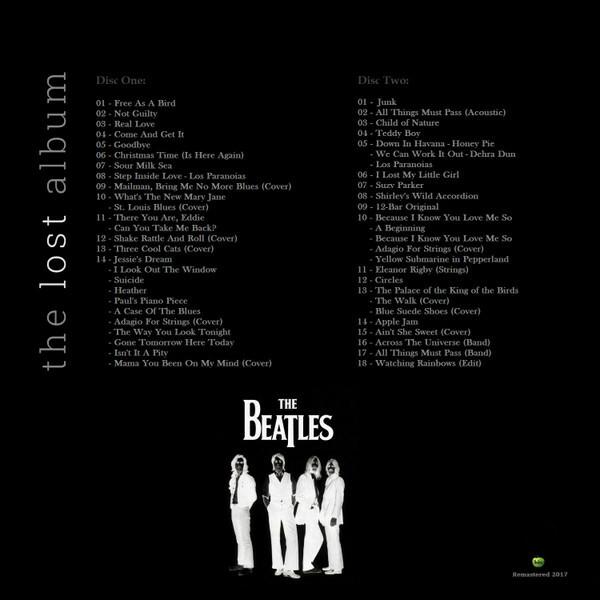 The overdubs and collages used were extracted from original Beatles material. 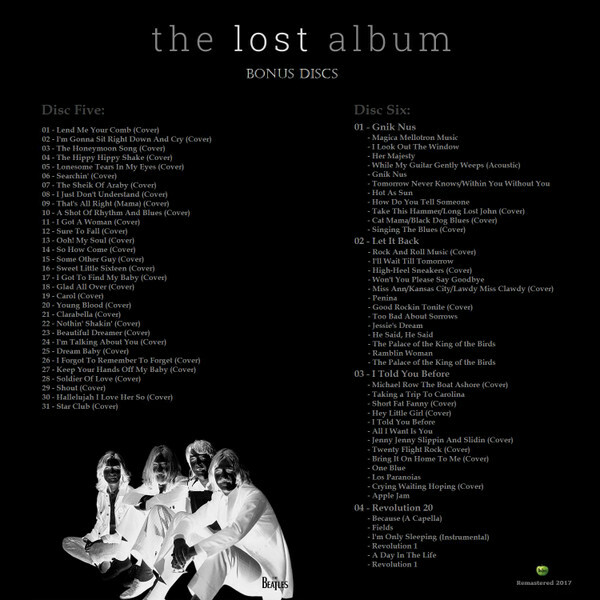 Six-CD box set compilation of Beatles unreleased tracks. (Never released in any studio album*(1) or as singles*(2)). 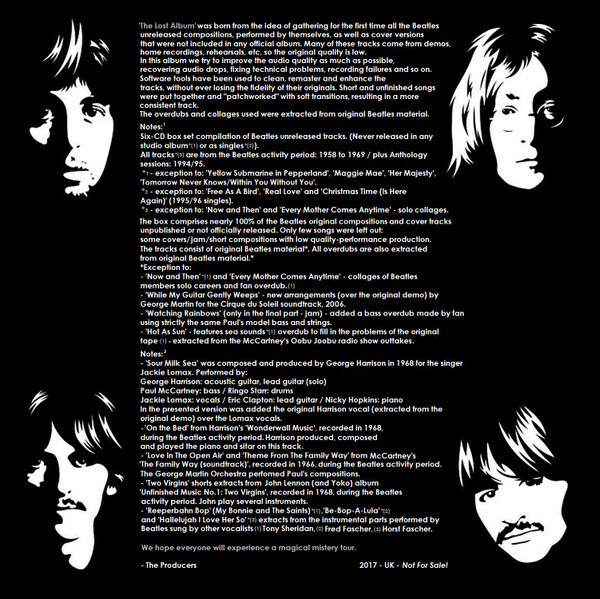 All tracks (*3) are from the Beatles activity period: 1958 to 1969 / plus Anthology sessions: 1994/95. *1 - exception to: 'Yellow Submarine in Pepperland ', 'Maggie Mae ', 'Her Majesty ', 'Tomorrow Never Knows /Within You Without You '. *2 - exception to: 'Free As A Bird ', 'Real Love ' and 'Christmas Time (Is Here Again)' (1995/96 singles). *3 - exception to: 'Now and Then' and 'Every Mother Comes Anytime' - solo collages. The box comprises nearly 100% of THE Beatles original compositions and cover tracks unpublished or not officially released. Only few songs were left out: some covers/jam/short compositions with low quality-performance production. - 'Now and Then'*(1) and 'Every Mother Comes Anytime' - collages of Beatles members solo careers and fan overdub (1). - 'While My Guitar Gently Weeps ' - new arrangements (over the original demo) by George Martin for the Cirque du Soleil soundtrack,2006. - 'Watching Rainbows' (only in the final part - jam) - added a bass overdub made by fan, using strictly the same Paul's model bass and strings. - 'Hot As Sun' - features sea sounds*(1) overdub to fill in the problems of the original tape. (1) - extracted from the McCartney's Oobu Joobu radio show outtakes. In the presented version was added the original Harrison vocal (extracted from the original demo) over the Lomax vocals. - 'On the Bed' from Harrison's 'Wonderwall Music', recorded in 1968, during the Beatles activity period. Harrison produced, composed and played the piano and sitar on this track. - 'Love In The Open Air' and 'Theme From The Family Way ' from McCartney's 'The Family Way (soundtrack)', recorded in 1966, during the Beatles activity period. The George Martin Orchestra perfomed Paul's compositions. - 'Two Virgins ' shorts extracts from John Lennon (and Yoko) album 'Unfinished Music No.1: Two Virgins ', recorded in 1968, during the Beatles activity period. John play several instruments. - 'Reeperbahn Bop' (My Bonnie and The Saints)*(1), 'Be-Bop-A-Lula'*(2) and 'Hallelujah I Love Her So'*(3) extracts from the instrumental parts performed by Beatles sung by other vocalists (1)Tony Sheridan, (2) Fred Fascher, (3) Horst Fascher. We hope everyone will experience a magical mistery tour. 2017 - UK - Not For Sale!